Meadowood is a pet-friendly community! Meadowood Blog > Meadowood is a pet-friendly community! It’s an exciting time in your life when you’re choosing a Life Plan Community. While you will have the opportunity to enjoy an easier, more carefree lifestyle, you also should consider the move’s impact on your loved ones. For many, we know that this includes how moving will affect the four-legged members of the family. With this in mind, we’re pleased to share that Meadowood is a pet-friendly community! Not only do we welcome pets as part of our community – but we also believe that the environment at Meadowood has benefits for those who bark and meow! Our park-like, 131-acre campus includes ample walking paths and green spaces for dogs to enjoy. The best part? There’s even an expansive Bark Park, so you can let Fido play fetch, run freely and make new friends with his/her canine neighbors! If your furry friend prefers the great indoors, he/she will find plenty of space to get comfortable in whichever spacious, thoughtfully arranged Meadowood residence you choose. The Centers for Disease Control and Prevention shares that that having a pet can offer several health benefits such as decreased blood pressure, decreased cholesterol levels and increased opportunities for socialization, which all aligns well with Meadowood’s commitment to wellness. Resident Gretchen Murray said that because Meadowood allows dogs, she can do one of her favorite things – enjoy the changing of the seasons with her pooch. “It’s really nice, the fact that I’m able to have my dog here and go for a walk on the perimeter road admiring the changing foliage and the wildlife we see along the way,” Gretchen shared. Although we are happy to welcome pets as a part of our community, we know that they’re not for everyone. For residents who do have pets, their pets will spend most of their time inside their owner’s residence, and they won’t be allowed in spaces such as the dining room or fitness center. Chances are that if you interact with a pet at Meadowood, it’ll be because you choose to do so. 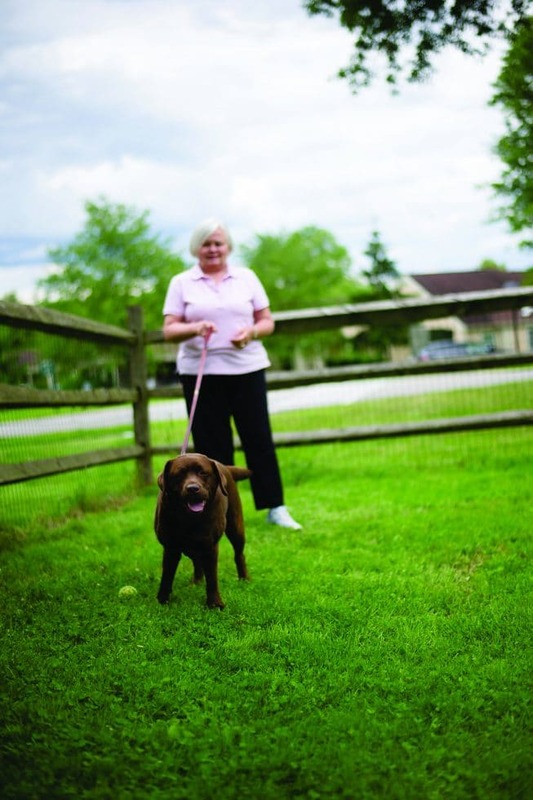 Finally, if you don’t own a pet but would still like to enjoy some animal interaction, Meadowood offers regular visits from therapy dogs, and many of our residents who are pet owners are happy to let friends join them for walks! Click here to schedule a personalized appointment to see how you (and your pet) would be at home at Meadowood, and to learn the specific guidelines for having a pet at our community. You can also call us at 610-584-1000. We can’t wait to hear from you!